I am a teacher of English in Denmark. I teach children aged 9 - 15. I hope you find my contributions useful and thereby save some time in your own preparations. I am very happy to be a member of this wonderful community. I just love it! I just prepared this worksheet on BE & AE for my intermediate students. Doing the task they can revise what they learnt about BE & AE. It is a different way of dealing with this traditional topic. It also has a focus on vocabulary. Have fun! Getting ready for Halloween? 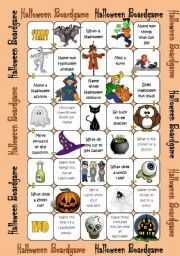 I prepared this boardgame for my students to round off the topic of Halloween on October 31. 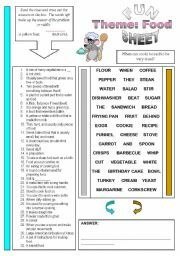 A reading activity. 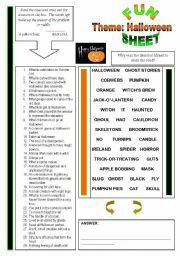 If you need to bring in an activity of fun for some time, I suggest you download this sheet. The student reads the clues and cross off the words that match the clues. The words left will be the answer to the question. 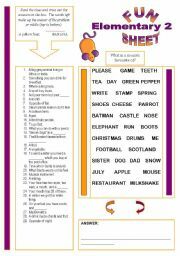 If you miss another way of testing your students� command of homophones, you should try this Fun Sheet. Instruction is on the printable. Have fun! As so many of you like this elementary fun sheet I decided to do a few more. -My own students liked the first one as well:) Students practise vocabulary and reading skills. Another Fun Sheet, this time on the topic of FOOD. It should be possible to use it with elementary kids with a couple of years of English. They read the clues and find the answers in the box. Words left make up the answer of the riddle. Have fun. Here is the Christmas Fun sheet for you and your kids. 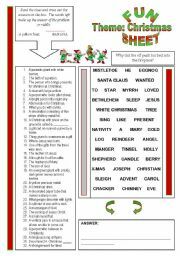 Hope you can use it along with other Christmas worksheets. This one is different from other Christmas worksheets. It allows the students to test their reading skills and they gain knowledge about the festival of Christmas. Have Fun! My folder has room for more so I decided to do a few more in the series. I am also encouraged by your "sweet" comments. Thank you! 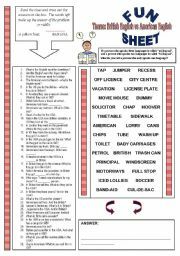 To new users this worksheet can be used as a filler, as a reading sheet with focus on vocabulary practice, and as an activity a substitute can do with your kids. 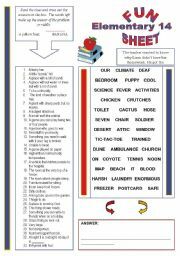 Another sheet to hand out when you want to make your lessons a little fun. 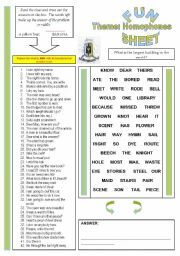 Students practise reading and test their knowledge Have fun! Use this ppt for speaking practise before oral exams. Students need to stay tuned for oral exams. Students pair up and take turns putting a question to their partner. They must answer the question as good as they can before they switch! 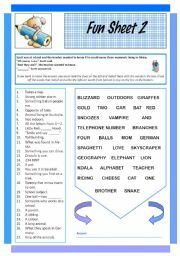 A PPT to be used in a revision or competition session. Divide the class into two groups and let the first couple (one student from each group) guess the opposite word of the displayed one. Initally there are six photos you can show and get students to relate to. They are followed by a final slide that has some task for the students to do.